Do you like driving cars that accelerate really fast, go round corners like a railcar and stand out from the crowd? If you answered yes to all three, then I think I have a new car for you to fall in love with. Alfa Romeo is always going to make a car look sensational – take the gob-smacking 159 of a couple of years ago and the Mito that is currently on sale. These are some of the best looking cars in their class. Very light, and offering small dimensions, the stunning new Alfa Romeo 4C is going to make for a great car on a fun weekend away with your special “better half”. Coming with just the two seats, perhaps you might fit in a track day to really spice up the weekend! Boasting a very low centre of gravity, loads of grip and a power-to-weight ratio that betters some supercars, the Alfa Romeo 4C is extremely quick – particularly when the road ahead has plenty of cornering work. The small car’s road holding and acceleration is set to embarrass a few of the more expensive supercars. The car’s steering is entirely non-power assisted for premium feedback at all road speeds. Whipping the Alfa 4C through the S-bends is a delight as the steering is geared high enough to let you take nearly all corners without shifting your hands from the wheel. What lies in the 4C chassis is a rigid carbonfibre set-up that only weighs an amazing 65 kg! Alfa Romeo designed a new engine for the 4C that is made of aluminium for even better weight reduction, and the power of the four-cylinder unit is a delightful 180 kW. The 1750 cc, petrol turbocharged engine is a gem and loves to put the hammer down – particularly in the mid-range. As the Alfa Romeo 4C only weighs 925 kg, the 193 kW per tonne is sensational and easily matches power-to-weight ratios of bigger supercars with more power and are twice the price. On paper, the figures speak for themselves: top speed 250 km/h, 0-100 km/h 4.5 seconds, 6.2 litres/100 km, 100-0 km/h in 35 metres. 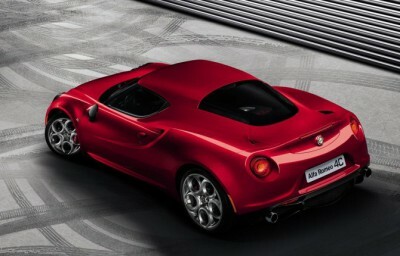 Another aspect about the new Alfa Romeo 4C is that it is a mid-engine designed car. It actually carries 60 % of its weight over the rear wheels – which are the driving wheels. The six-speed dual-clutch automatic gearbox has paddle shifters, and all wheels are backed with premium Brembo disc brakes. 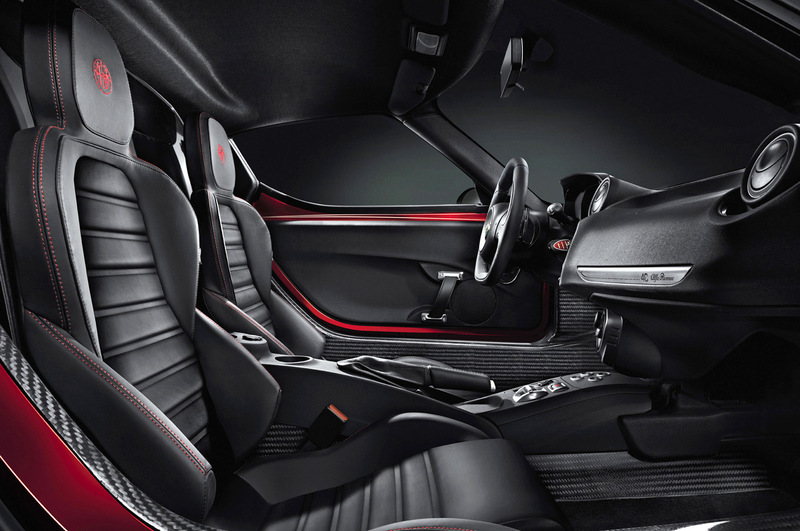 Inside the new 4C Alfa is a simple interior design with bucket leather seats. Standard colour and trim are black leather with red trimmings. A nice sound system for enjoying your favourite music tracks while pelting around the race track is a standard feature. Air-conditioning is also standard – halleluiah. You’ll find some storage areas for putting wallets and other items inside, and there is a set of cup-holders. The striking electronic tacho dial reveals all the essential information: speed, gear position, fuel, temperature, day and date. When you select the ‘Race’ position on the low centre console you can set the car’s throttle response, gearchange time and degree of chassis stability intrusion from four settings. The colour of the dials also change to set the racing tone. For a car that packs a huge punch in the performance stakes, looks unique and handles with the best agility, you going to find it hard to match the 4C. The new Alfa Romeo 4C is soon to be available in Australia, so you’ll need to be quick to get your hands on one, as there are only limited numbers at this stage. For any more information on the Alfa Romeo 4C models, or for that matter any other new car, contact one of our friendly consultants on 1300 303 181. If you’d like some fleet discount pricing (yes even for private buyers! ), we can submit vehicle quotes requests out to our national network of Alfa Romeo dealers and come back with pricing within 24 hours. Private Fleet – car buying made easy!